Everything we produce at Design Awards is bespoke. 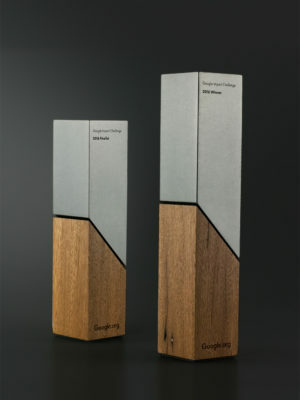 We have two fully equipped factories in Melbourne and Sydney catered especially to crafting beautiful trophies and as such are able to offer a large range of award types manufactured from a variety of different materials and for all kinds of industries, from Government to Media & Entertainment and Education to Business. The following list contains common requests but is not exhaustive, and even though everything is custom we do have a dedicated bespoke page for special projects. We also make 3D printed trophies, resin trophies and much more. Contact us today to find out more.